Developing strategies to limit peatland soil organic carbon loss and reduce greenhouse gas emissions in boreal, temperate, and tropical regions of peatland and agricultural wetlands. The Peatland Management Network is a network of the Croplands Research Group of the Global Research Alliance. Scope: The network promotes improved water management in conventional agriculture and innovative approaches in conservation-focused rewetting projects as well as productive use of wet peatlands (“paludiculture”) and peatland restoration, a research area that is not well covered elsewhere in the Croplands Research Group. 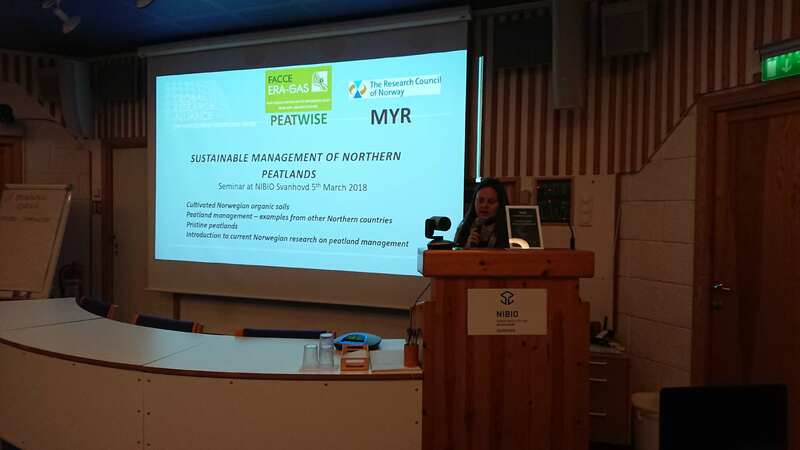 The network organised a workshop in March 2018 in Norway together with MYR and PeatWise –projects, where also local stakeholders and Northern European Research teams participated. Making the Network globally relevant and different from existing groups (e.g., FAO). Identifying where lands should be cultivated and the best management options to reduce emissions. Identifying what peatlands should/could be restored based on the policies and requirements for each country. Completing a stocktake and inventory –of fertilisation and drainage policies globally. Creating a database of sustainable fertiliser practices. Contact Alliance country representatives to expand contacts. Opportunity to develop a proposal for a Horizon 2020 funding call on greenhouse gases. The Peatlands Management Network is expanding participation to other countries that have cultivated peatlands, such as the Baltic region and South East Asia as the Network should consider mitigation options for boreal systems and tropical peatlands.